Afghanistan has about 26 million people. 5.7 million live in urban areas. The rest live in rural areas or countryside. The following are fourteen cities of Afghanistan in order of population. The estimates are from 2006. 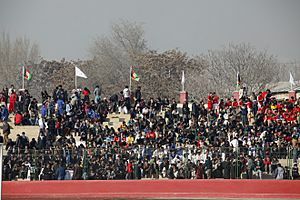 Sport fans inside the Ghazi Stadium in the capital of Kabul, which is multi-ethnic and the only city in Afghanistan with over 1 million population. 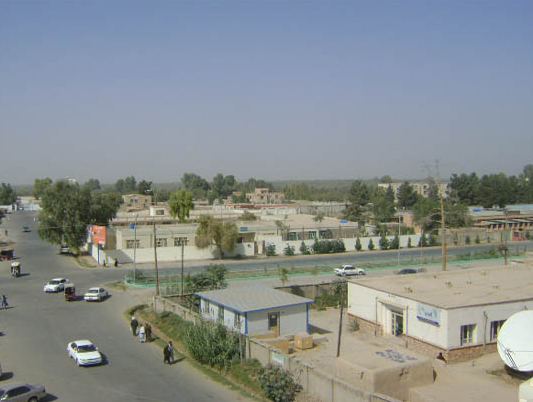 The Aino Mina new housing project on the outskirts of Kandahar, which is the second largest Afghan city. List of cities in Afghanistan Facts for Kids. Kiddle Encyclopedia.